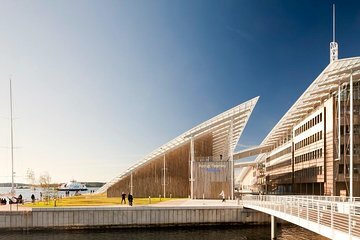 Overlooking the Oslo Fjord, in an iconic building designed by Renzo Piano, the Astrup Fearnley Museet features an extensive collection of contemporary art. Museum curators blend the work of Norwegian artists with that of legendary figures like Jeff Koons, Damien Hirst, and Cindy Sherman. Visitors enjoy the gift shop and museum bar, Vingen, which serves drinks with a view of the fjord, beach, and sculpture park below.